New Nike in Store Saturday 8.22.09. 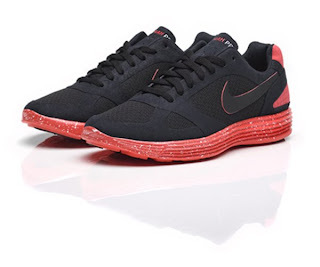 Nike Lunar Mariah. Black/Hot Red. The Nike Lunar Mariah is a seamless blend of past and present innovation. Originally developed in 1980, the Air Mariah is a premier lightweight road and track racing shoe from Nike that remained in the line through the 90s. Taking the silhouette and materials of the Nike Eagle for the upper, the Air Mariah was the first to feature full-length Air. Fast forwarding to 2009, the latest foam cushioning and upper construction innovation gave Nike Sportswear the tools to make the original Air Mariah even better. Adding Lunar foam, a lightweight and extremely responsive foam developed for our athletes, no sew construction, as well as the latest materials developed allowed the Nike Sportswear footwear designers to re-build a Mariah upper that is lighter and more comfortable than ever.